Our style is considered to be more natural. 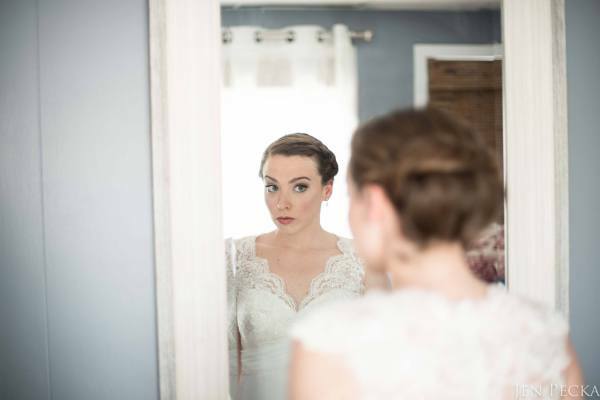 Our goal for all of our brides is to enhance their natural beauty, so that they look and feel like the best version of themselves. How early should I reserve my wedding date? We typically book wedding dates 6-12 months in advance. A signed contract and $50 non-refundable deposit is required to reserve your date. The deposit will be deducted from your balance the day of the wedding. We do not charge a travel fee for weddings within a 35mile radius of Oneonta NY. Weddings outside the 35mile range will be subject to a travel fee of 50cents per mile. How long does hair and makeup take? Each service has an allotted time frame. It is important to discuss a wedding day time line with your vendors and stay on schedule to ensure a stress free morning the day of your wedding. Should I wash my hair the morning of my wedding? We love this question! We actually prefer the hair be a little "dirty". If you are styling your hair for the rehearsal the day before, just leave it for us the day of. Hair styles best when it is blown dry with a little bit of product in it. You can still shower the morning of, just throw your hair up and don't get it wet. Your face should be clean and free of makeup. Please apply moisturizer for the best makeup application.